﻿ Zheravya hill and izborsk. Pskov region. Pskov city situated in the north-west of Russia. Old Izborsk, fortress of the 14 century. Izborsk is one of the oldest towns in Russia, began from a small settlement of the Slavic Krivich tribe. A wooden fortress was built in the settlement in the mid 10th century. A stone fortress occupying the hill's entire summit was built at the end of the 11th century. In 1303, the town's site was moved to the Zheravya hill, some 700 meters from the old site. 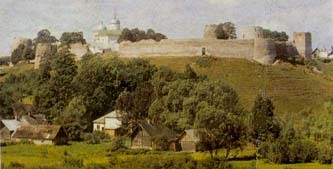 In the early 14th century, Izborsk fortress was transferred from its original location to a larger neighboring hill - Zheravya or Zhuravlinaya (Crane) Hill, where it still stands today. That fortress stands on a natural rock base, like it grows directly out of the hill. Sometimes it is difficult to see where the hill ends and where the wall begins. The total length of the walls is 625 meters. The mighty walls made of limestone slabs, six fighting towers, two entries (from the gates), two secret exits still exist in fortress. The south, the main entrance is near Temnushka (Dark) Tower. Both entries to the fortress was interesting in construction. Here was a trap - zakhab. Secret path down to the water still exist here in our time. You can to see this Fortress was built of stone and was vigorous and inaccessible stronghold, capable to bear the attack of any enemy. The stone St. Nicholas Cathedral equal in age to the fortress - stands by the main gates. It is near the wall and could, in case of attack, have been used as an additional fortification to conceal the city's defenders. The secret exit under the wall. The north entrance by Talavskaya Tower. Here was a trap - zakhab too. The towers were multi - tier. Inside they were divided into tiers made of wooden beams and connected by wooden stairs. There are plenty of the chapels in this area. The stone crosses can be met here frequently. That crosses are near by church of St. Sergius. The church of St. Sergius is situated near by entrance to the fortress and was built in the 17th century. Its belfry above the doorway faces the main gates. In the St. Sergius Church has been opened a branch of the Pskov Museum on the basis of archeological discoveries made in Izborsk.